Ozzy Osbourne joined ROYAL MACHINES on stage last night (Saturday, December 16) at The Roxy in West Hollywood, California to perform six songs, including “I Don’t Know” and the BLACK SABBATH classics “Paranoid” and “Iron Man”. Fan-filmed video footage of his appearance can be seen below. 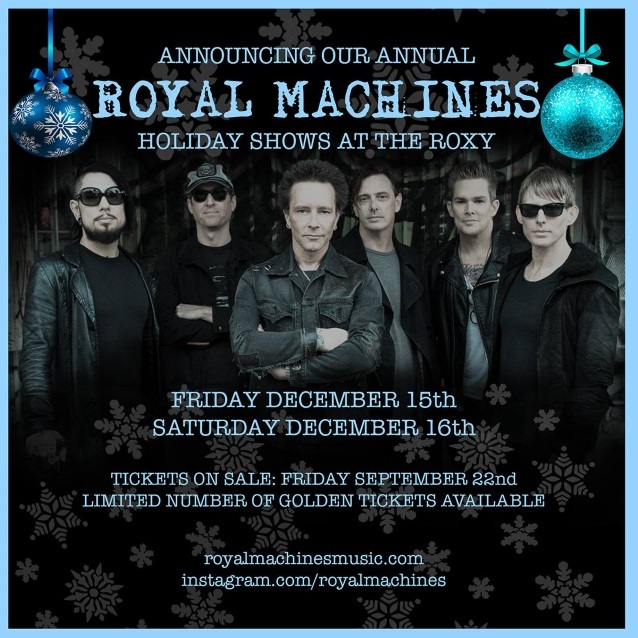 ROYAL MACHINES is the “all-star covers fun-times band” featuring former CAMP FREDDY members Dave Navarro (JANE’S ADDICTION, RED HOT CHILI PEPPERS), Billy Morrison (ex-THE CULT bassist), Donovan Leitch (son of legendary folk singer Donovan), and Chris Chaney (JANE’S ADDICTION, ALANIS MORRISETTE), alongside frequent CAMP FREDDY collaborator, singer Mark McGrath (SUGAR RAY), and acclaimed drummer Josh Freese (THE VANDALS, DEVO, A PERFECT CIRCLE). Morrison, the MACHINES‘ musical director, is good friends with Ozzy, who made an appearance on Billy‘s 2015 solo album, “God Shaped Hole”.